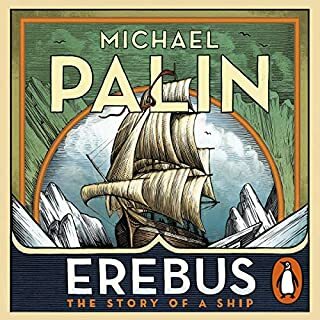 In his major new work, Michael Palin - former Monty Python stalwart and much-loved television globe-trotter - brings to life the world and voyages of HMS Erebus, from its construction in the naval dockyards of Pembroke, to the part it played in Ross’s Antarctic expedition of 1839-43, to its abandonment during Franklin’s ill-fated Arctic expedition, and to its final rediscovery on the seabed in Queen Maud Gulf in 2014. I downloaded this recently and have already 'read' it twice, and tempted to go round a third time. The story is fascinating and is brought to life delightfully by Michael Palin. It is often a moot point as to whether it is best for an author to read their own work. In this case there is no doubt. Palin delivers the tale with the same easy charm, enthusiasm and wry amusement we know so well from his travel series. The pace is easy but never drags; he informs us about the technical aspects of the ships and their journeys but his focus is always mostly on the human aspects of the rigours of exploration, and the personalities involved. Naturally we miss the illustrations and maps which a traditional factual book would provide but this is more than made up for by having the author lead us through his own voyage of discovery of the tale of Erebus. In the remote wildness of Egdon Heath, the crossed love affairs and marriages of a small group of people are played out against the background of nature’s beauty and indifference to mankind. Through a series of vivid incidents and encounters, The Return of the Native moves in a relentless drive towards tragedy, as the plans and dreams of the lovers miscarry, defeated by chance, or destiny or self-deception. In their unhappy stories, Hardy gives us a powerful dramatization of his bleak philosophy, his belief in man’s helplessness before the malevolence of the universe. The best of Hardy - magical! 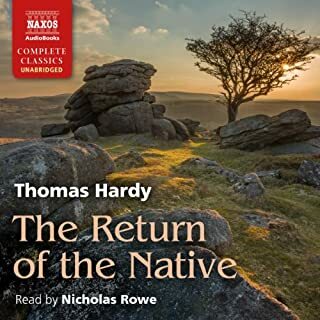 Where does The Return of the Native rank among all the audiobooks you’ve listened to so far? Not one of Hardy's most well known (or often dramatised) works, this is a bit of a slow burn but becomes fully absorbing. The star character is really the heath itself which is gradually brought to life through description and the parochial lives of its inhabitants. The plot, apparently rather simplistic at first, develops through a series of misunderstandings and misadventures to an end both tragic and stoical. Recommended. The narration is nicely measured to the pace of the book.